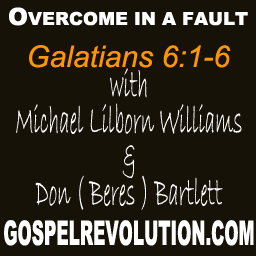 In this week’s Probing, Provocative, Powerful Powercast, Michael and Don continue their study in Galatians. They compare and contrast what living under the Law was all about in all its implications and unfortunately how people on this side of the Cross put themselves back under it in an attempt to live “Biblically”. For example, what does the Mosaic Law have to say about “no fault divorce”? What is “Biblical divorce”? Here is the good news! If you slip, and “fall from grace” by putting yourself back under the law and its shame and guilt system, you can get out just as easily! “Repent”, which simply means “change your mind”. You went back under the law through your thoughts. You get out of it the same way. Change your mind! Know you are absolutely free to be your most authentic self all provided through the redemption of Christ! Sometime do the book of Phillipians like this. Some years back I used to listen to your podcast, but had some serious illness and a fall. Thankfully I am doing well now. Anyway I’ve started listening to you again!! I have been looking for Jeff Roberston and would like to get in touch with him again. Would you please pass this along to him and give him my phone # 608-213-7222, Jan Heller, Madison Wi. Thanks soo much!! !